The argument that tax cuts create or increase revenue is an old myth that simply refuses to go away. The logic behind this argument is that cutting taxes will stimulate spending (since investors now are now encouraged through reduced tax rates) that will result in GDP growth. This growth in GDP will result in increased tax revenues so significant that they will more than offset the drop in tax revenues that result from a lowered tax rate. The inverse to this is that increased taxes lower tax revenue by discouraging investment, which in turn lowers tax revenues so drastically, that they offset the added increase coming from the tax rate increase. One of the reasons Republicans and other self-ascribed fiscal conservatives are able to get away with this is, is the superficially plausible argument that the Reagan and/or Bush tax cuts grew the economy and created revenue. To understand the fallacy of these arguments, it is necessary to understand economic growth during business cycles and over a long period of time, and how this affects tax revenues. Generally speaking, when GDP grows or shrinks, revenues grow or shrink along with it ( since the income or earnings being taxed are proportional to GDP). So while revenues fall when the economy is in a slump or recession, they increase when the economy is in a recovery and certainly during a boom in economic growth. This happens regardless of the tax rates. 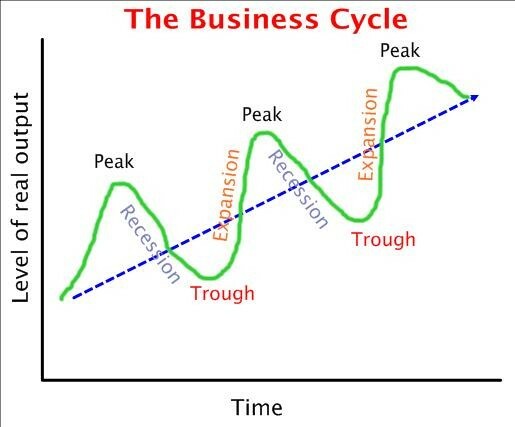 The chart below shows the historical Boom and Bust cycle of the market (note: this is not to be confused with GDP, though there is a rough correlation between the two). It’s also important to note that over time, GDP grows. The only time this changes is during economic downturns. But the general trend is upwards. GDP grows because the economy grows and because of inflation the value of the dollar falls over time, which also means the dollar value of the GDP grows because of this. As GDP grows, so will revenue (since a certain percentage of the GDP is taxed, and therefore, tax revenues will remain somewhat proportional). By conveniently pointing to places where tax cuts were enacted at or around the time of a recovery or boom, tax cut advocates argue that tax cuts increase revenue. The problem with this is that the revenue increases following the Bush and Reagan tax cuts are dwarfed by the revenue increase following Bill Clinton’s tax increase on the wealthiest Americans. In fact, as a percentage of GDP, post-Reagan & Bush tax cut revenue falls below the 1965-2005 average. In other words, revenue increased because the economy was recovering/growing, and the tax cuts have little (probably nothing) to do with growth in GDP. if anything, these tax cuts actually lowered revenue increased from what they would have been otherwise. So the real question to ask is this: how much revenue did these tax cuts cost us? See Historical Tax Rates. Investment has been shown to increase both after tax cuts and tax increases. 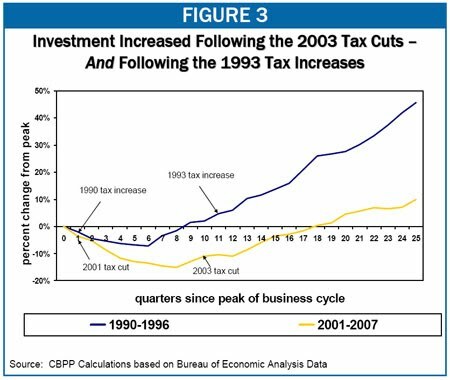 Investment increased both after Bill Clinton’s 1993 tax increases and after George W Bush’s 2003 tax cuts. The reason is simple: investors were confident because the economy was growing and therefore felt that it was a good time to invest. In other words, it’s demand and other market signals that investors care about most, not tax rates. Tax rates can no doubt play a role (especially if they are disproportionately high), but the tax rate fluctuations between the Clinton vs Reagan and Bush tax rates are rather inconsequential to investor behavior. 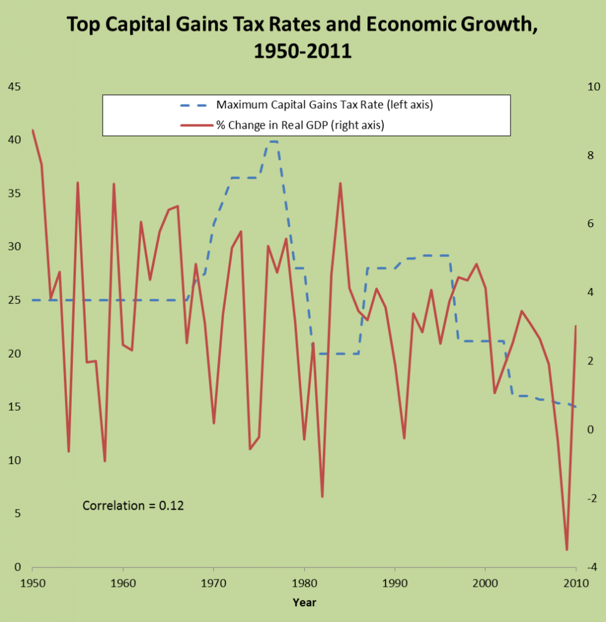 Over a longer timeline, we can see if there exists a correlation between taxes on the wealthy and GDP growth. Unfortunately, we find no correlation between the two. 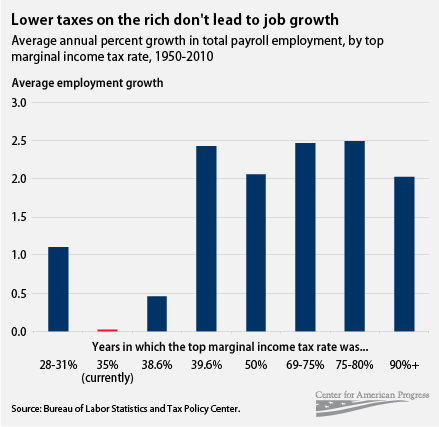 Cutting taxes on the rich appears to have resulted in no increase in the rate of GDP growth. According to the logic of tax cut advocates, the post World War II boom should never have happened given that tax rates on the top earners were exponentially higher than they are now (something to keep in mind when Republicans claim that raising taxes on the rich back to what they were during those disastrous Clinton years (as Obama has been trying to do) will stifle economic growth). These lack of correlation between lower taxes and increased economic growth flies in the face of the assumptions of many. But upon a closer look, it’s easy to understand why higher taxes can actually encourage more investment in the economy. 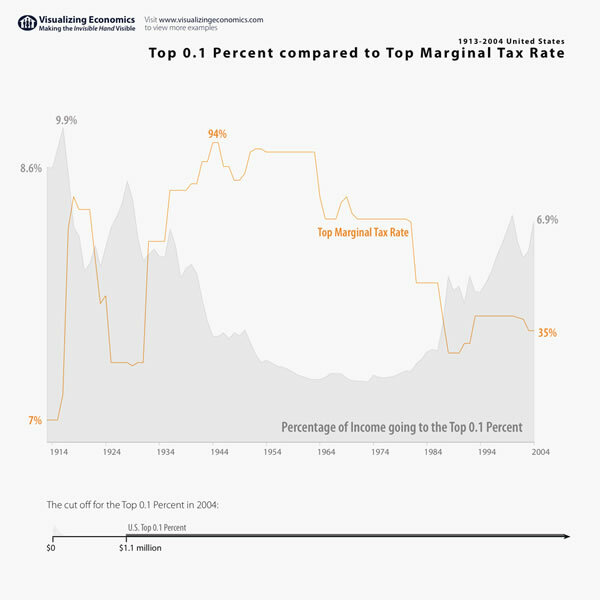 The Economic Recovery Tax Act of 1981 (also known as the Kemp-Roth Tax Cut) cut the top marginal tax rates from 70% to 50% and the bottom rate from 14% to 11% in addition to cutting capital gains, estate and corporate taxes. Under the Tax Reform Act of 1986, the top marginal tax rates were reduced further (from 50% to 28%) and increased the bottom rates from 11% to 15% (in other words, taxes on the lowest earners were raised to 1% higher than when Reagan stepped into office. Many Reagan apologists claim that these tax cuts created the robust economy that followed. However, this ignores the effects of the Federal Reserve’s lowering of interest rates. Reagan also increased military spending and ran up the federal deficit (the combined effect of tax cuts and increased spending). In other words, Reagan did exactly what Republican pundits who praise him are currently criticizing Obama for. Reagan advocates claim his tax cuts bolstered the economy while ignoring the lowered interest rates and increased deficit spending (kind of like an ongoing stimulus package). Under the Economic Growth and Tax Relief Reconciliation Act of 2001 income taxes were set to reduced rates by 2006, including the top income tax rate which fell from 39.6% to 35% and there were cuts to the estate and gift taxes as well. The Jobs and Growth Tax Relief Reconciliation Act of 2003 would speed up many of the scheduled tax cuts from the Tax Relief Reconciliation Act of 2001. Just like the situation with Reagan, tax cut advocates claim that the Bush tax cuts stimulated the economy. But there is little correlation between the two. And advocates of this ignore the economic effects of the housing boom/bubble (which would burst soon afterward and lead us to the problems we currently face). Ironically, the same tax cut advocates who pretend the Clinton tax revenue boom was merely an anomaly caused by the internet bubble/boom simultaneously housing bubble/boom when crediting the Bush tax cuts for this growth. All of these meandering tax rates can get confusing. Here are some tables which show historical tax rates. This may help give readers a better perspective. What we can find, of course, is a correlation between tax cuts and the wealthy and wealth/income disparity. 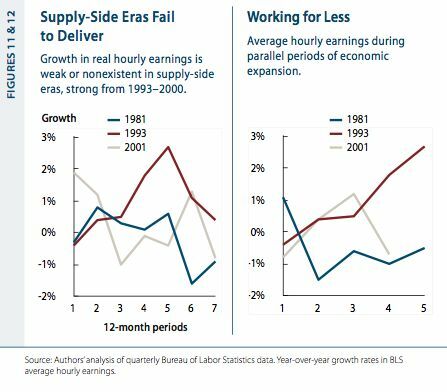 In fact, the eras supply-side economics have been attempted (supply side economics argues that cutting taxes on the top earners frees up money at the top, which is then invested back into the economy, filtering down to and benefiting those in the middle and lower income brackets) have been followed by a decrease in real hourly earnings. This is important to keep in mind when people on the right complain that those at the bottom pay little/no federal income taxes. The problem here is that the earnings for people in those tiers have fallen as more of their work has gone towards those at the top. It’s also important to keep in mind that even those who don’t pay federal income taxes are still subject to payroll taxes (and since the social security portion is capped at $106K, the payroll tax rate is actually lower for anyone making over this amount) and whatever state and local taxes they are subject to. It’s also important to keep in mind that the capital gains tax (where much of the wealth is made) is taxed at a mere 15%. Last year about 80 percent of these revenues came from personal income taxes and payroll taxes. The mega-rich pay income taxes at a rate of 15 percent on most of their earnings but pay practically nothing in payroll taxes. It’s a different story for the middle class: typically, they fall into the 15 percent and 25 percent income tax brackets, and then are hit with heavy payroll taxes to boot. Back in the 1980s and 1990s, tax rates for the rich were far higher, and my percentage rate was in the middle of the pack. According to a theory, I sometimes hear, I should have thrown a fit and refused to invest because of the elevated tax rates on capital gains and dividends. In other words, trickle-down economics (the basis for Reagonomics) is a fallacy. 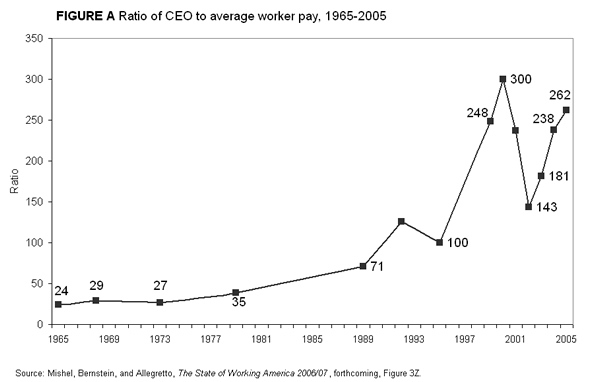 The wealth does not trickle down but rather t coagulates at the top. 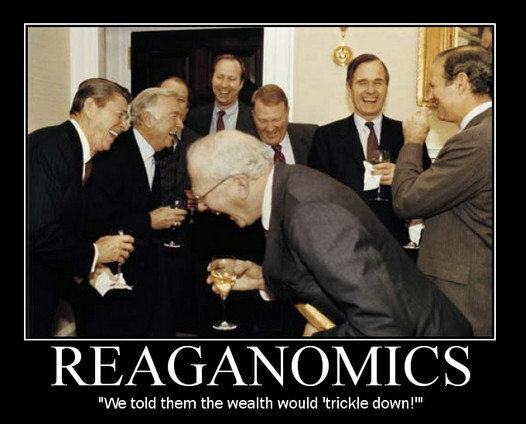 Hence the applicability of this mocking of Reaganomics. As Bruce Bartlett, who held senior policy roles in the administrations of Ronald Reagan and George H.W. 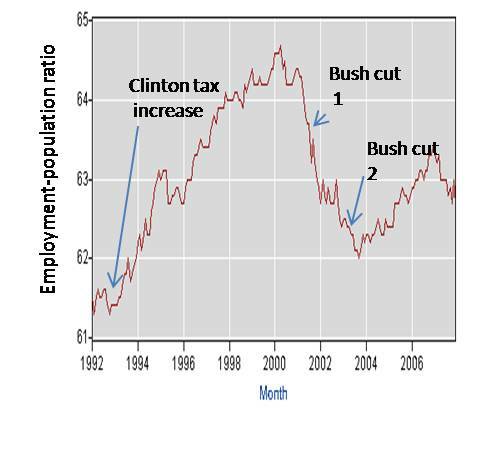 Bush states in his article, Are the Bush Tax Cuts the Root of Our Fiscal Problem? It would have been one thing if the Bush tax cuts had at least bought the country a higher rate of economic growth, even temporarily. They did not. Real G.D.P. growth peaked at just 3.6 percent in 2004 before fading rapidly. Even before the crisis hit, real G.D.P. was growing less than 2 percent a year. The fact that a former adviser to Ronald Reagan and George H.W. 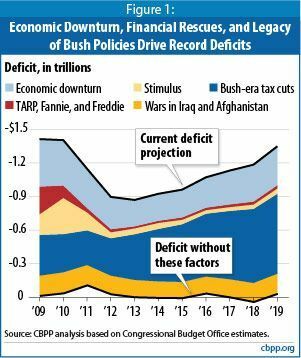 Bush is explaining why the Bush tax cuts are the root of our fiscal problems shows just how far over the edge the right/Republican party/fiscal conservatives have gone. In fact, the current debt/deficit problem is really tied more to lost revenue (from the Bush tax cuts and lost revenues from the recent economic downturn) than increased spending. The Republican’s refusal to allow the Bush tax cuts on the top earners back to those of the Clinton years contradicts the notion that they are serious about solving the debt problem. Our political playing field no longer consists of a debate on taxes between two sensible points of view. 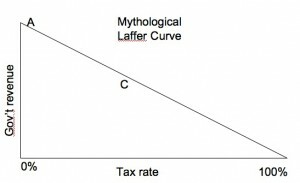 Rather we have one sensible point of view which explains why taxes must be raised in order to help close the gap between revenues and spending, and another view which argues (no matter the available facts) raising taxes will only stifle economic growth and that cutting taxes will raise revenues (and as demonstrated above. a series of disingenuous tactics, mostly comprising of omissions, are used to make this case). This brings us to the Laffer Curve. 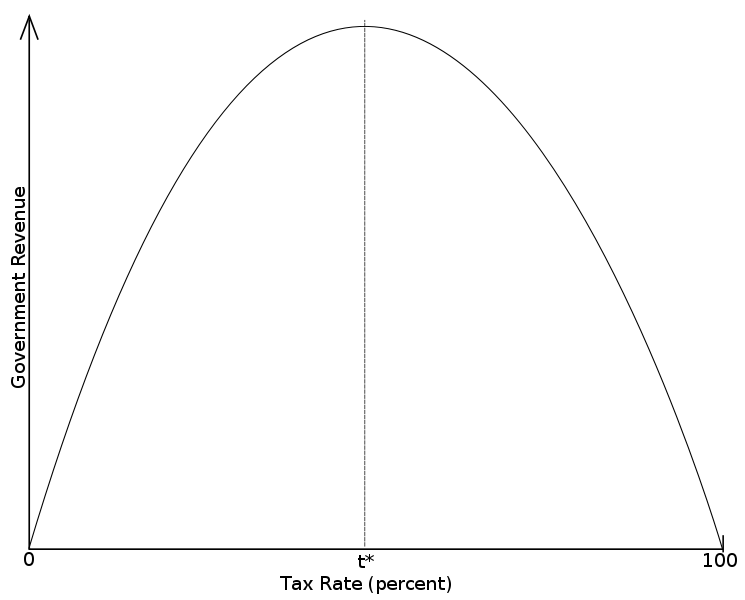 Generally speaking, the Laffer curve measures the inverse correlation between tax rates and revenues. 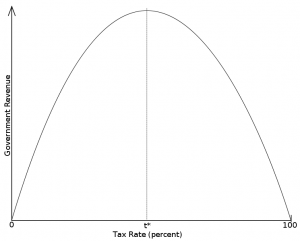 A tax rate of 100% will clearly be less than optimal because taxing 100% of income leaves no motivation for earning and will, therefore, yield no tax revenue. On the other hand, a 0% tax rate delivers 0 tax revenue, because no matter how much is earned, none of those earnings are taxed. Economists generally disagree where the optimal point in this curve lies. 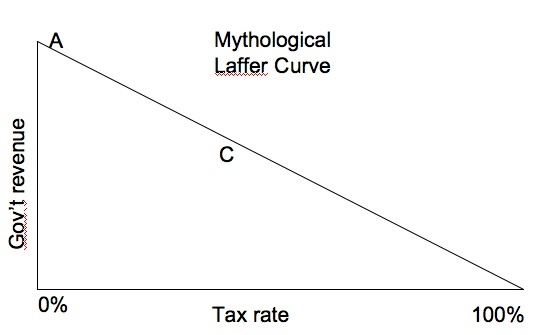 However, in the view of the right (or Republicans, or the Tea Party, or fiscal conservatives), there is no such thing as a Laffer curve. Rather, there appears to be a Laffer line whereby cutting taxes will always lead to increased revenues. This, of course, is nonsense. 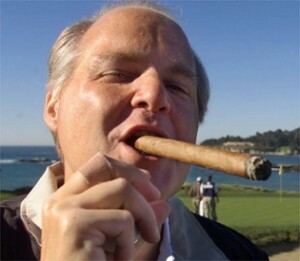 But generally speaking, this is how far to the right the debate has shifted. In order make the argument seem “bipartisan” (and/or perhaps to make it appear that Democrats have shifted to the left since JFK’s time in office), many tax cuts advocates pull Kennedy’s quote out of context. As can be seen in the top marginal tax rate chart above, the top marginal tax rate was above 90% when Kennedy made this comment. He would lower them to about 70%, where it would stay until Reagan would lower them further, Hence, President Kennedy was merely making the argument that a 90% top tax rate was too high. 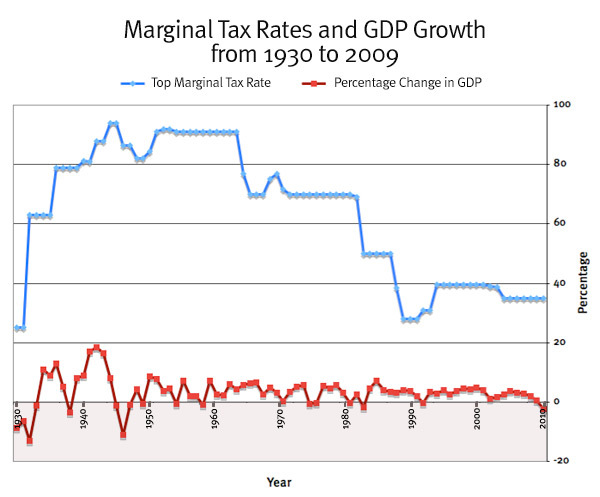 Today the top marginal tax rate stands at 39%, just over half of what Kennedy lowered them to. The evidence that tax cuts increase revenue revolves entirely around nit-picking specific points in history and ignoring the overall effects. It also depends on assumptions about aggregate behavior that have turned out to be false. In other cases, advocates have taken quotes (like President Kennedy’s) out of context. Any argument that tax cuts (especially on the wealthiest Americans) increase revenues simply ignores the facts and misunderstands human nature. The wealthiest Americans will invest as long as they expect a return on their investment. This means their main concern is the health of the economy (demand, interest rates, the market, etc). In fact, one can even argue that higher tax rates encourage more investment and production in order to offset taxed earnings. In times of economic growth, the wealthiest Americans (and for that matter, corporations) will invest. In times of economic downturn, both will, in general, hold onto their money, no matter how low taxes are. Any argument that the Reagan of Bush tax cuts increased revenues of GDP growth is nothing more than a selective play on the facts. 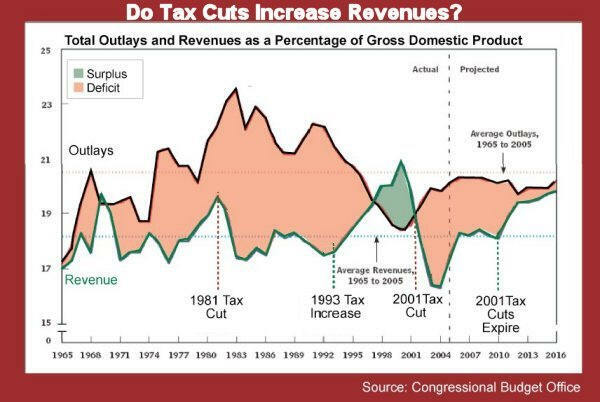 Do Tax Cuts Ever Increase Government Revenues? Fact: Tax cuts decrease tax collections.